Learn how our Tempra MHRV helps keep humidity down in the kitchen and the air fresh, even when drying laundry in winter. What are the Lo-Carbon Tempra Specs? Why MHRV? As we reduce 'uncontrolled' ventilation to reduce heat loss/demand, we need to introduce controlled ventilation to keep levels of humidity and CO2 (and other pollutants) down. MHRV does that efficiently, with low heat loss per unit of ventilation. MHRV stands for Mechanical Heat-Recovery Ventilation. Keeps air fresh and humidity down, retains heat. Does what it claims on the tin, still going after 5 years. Maybe a tiny bit louder than expected, and of marginal length to go through our wall. Not so easy to clean as the HR25 without access to the outside. See the article on MHRV (Mechanical Heat-Recovery Ventilation) more broadly. AKA "MVHR" and SRHRV (Single Room Heat Recovery) amongst other names! As of October 2012 we'd refitted part of the kitchen and were thinking about doing the rest. The work included replacing the existing gas stove and replacing the old passive (air-grille) ventilation with MHRV such as an HR-25. However we wanted manual boost only, since an automatic humdistat would be likely to annoy us by coming on noisily with us present in the kitchen, given our experience with the bathroom HR25H. As of 2012/10/07 I was looking at the HR200WK for kitchens, though at 25W--140W and ~£500 it was considerably more heavy-weight than the HR25. HR25 noise levels db(A) are 16.8/49.2 vs 19--46 for the HR500WK. The heat recovery is also lower for the HR500K (~75%--65% vs 80%), but the flow is much more nearly balanced at trickle 60m^3/h (17l/s) extract and 50(13) intake for trickle up to 220e and 220i in boost, and compares to the HR25 20e/8i trickle and 55e/36i boost, ie 3--4x. The HR500WK specifies a minimum 600mm separation from a gas flue. The Kair HRV150 was also a contender though takes 9W in trickle mode to shift ~5l/s, which seems poor, while claiming up to 86% heat recovery. The Vent-Axia Lo-Carbon Tempra range came to my attention and looked interesting. The 'P' pull-cord model for boost mode is ~£180, up to "78% efficient", is marked as suitable for kitchens, trickle mode consumes ~2W shifting 6l/s (22m^3/h), or ~5W @ 9l/s (32m^3/h) in 'trickle high' mode, rising to 13l/s (47m^3/h @17.2W) on boost and even a little higher 'intermittent', so similar to the HR25 in extract throughput and a little lower heat recovery. The Tempra is balanced, though can be put in summer extract-only mode. I'm trying to find a space for MHRV and my current thinking is to use the same through-the-wall single-room Vent-Axia MHRV HR-25 as we have in the bathroom. The most obvious spot on an external wall is a couple of feet from the gas boiler flue and roughly level with it. This new penetration would emerge above a (not-much-used) public footpath as the gas flue does ~10 feet up: is that a technical trespass, ie do I officially need planning or a waiver or something? I was referred to this very useful document: Location of flues to prevent ingress of gas and oil firing flue gases under all weather conditions (PDF) from 2006, and also a discussion "distance between boiler flue and MVHR intake" at the AECB. The nub seems to be to keep the flue and vent at least 30cm apart (and not under a common overhang, which does not apply to us). I should possibly check 'Approved Document J' and BS5440 table C1. The HR25 installation documentation says: "14. 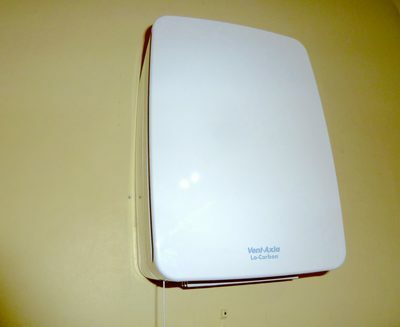 The external cowl of the unit must be sited at least 500mm away from any flue of gas or solid fuel appliances. This is to avoid back flow of gases entering the room." Inspection suggests that we could ensure a 50cm horizontal spacing and have the MHVR pipe a little below the flue level so as to be out of the way of the buoyant warm flue gases. 2012/10/08: just spoke to local building control and for a balanced combi flue (as mine is) then regs / Part J says 300mm+ (else 600mm+) to my MHRV intake is fine. Now seeking permission from the housing department for the works (it owns the path over which my pipe would emerge), to avoid a trespass. 2012/10/09: A Vent-Axia "Technical Support Advisor" recommended "the tempra for ease of maintenance and replacement" over the HR25, and as to spacing from the flue "although 300mm will be sufficient if you can be 500mm away then this would reduce the risk of backfeed." 2012/10/22: received a letter from RBK Housing today permitting me to install the MHRV (subject to 300mm clearance from other wall penetrations, etc). 2012/11/03: I have read The Laundry Design Guide. Though I do not agree with some of their suggestions such as reintroduction of hot-fill washing machines (hot water simply won't reach many machines before they've filled with the water already in the pipework! ), I do think that the 8l/s/person target ventilation figure is useful. That would keep CO2 levels acceptable at below 1000ppm in the main, and a Tempra is thus about 1 person's worth on trickle, 2 on boost. I suspect we'd mainly manually set boost mode when RH% is getting too high, such as during 'passive drying' of laundry. 2012/11/19: Tempra arrived today (pack shots); seems sleeker than the HR25 in various ways. The heat-exchanger of multiple plastic pipes running the length of the vent looks robust and simple. or ~250mm+ total thickness cf maximum thickness 318mm for the fan, eg see just before brick outer was cored. Note that there are still fixed vents in the kitchen wall (on the far side of the room from the Tempra) that should remain until such time as the gas cooker goes to avoid CO (carbon monoxide) and other risks. We are using "Trickle Low" and "Boost" factory defaults I think, with "Trickle Low" being by far the most energy efficient in terms of flow rate per Watt (~0.3W/l/s), and the intention is to leave the fan on 'trickle' all the time (possibly not at night depending on noise) with only the occasional boost, eg for a new load of washing hung up to dry. The Tempra's trickle flow represents about one person's ventilation needs. Yes. Over time we're decided that it really helps with drying the laundry for example, and it's quiet enough even at night. We don't use boost much. 2012/11/28: initial observations suggest that it does indeed do the job, especially when it's cold (and thus low-humidity) outside. The kitchen air is fresher and warmer than I'd otherwise expect, and humidity in the kitchen seems to be brought down quickly, eg from 88%RH after with cooking and supper to 78% in less than 30 minutes, and kept to 70%RH or lower even with laundry drying. Boost mode helps a bit when RH is high, but the slow-and-steady 6l/s trickle mode is likely much more efficient at keeping RH down over a day. Boost is OK to leave on when out of the kitchen and hardly audible from the alleyway, not much more than the gas flue, so unlikely to be a nuisance and not much different to the portable dehumdifier. After a few nights we're still deciding if the trickle mode is too noisy to be left on all night (as the fan is directly below the master bedroom). 2012/12/02: RH in the kitchen has been down to just over 50% with the cold (~0°C) air outside for the last few days. We have had the fan off the last few nights because of the noise. 2012/12/14: Although for noise reasons we have not had this kitchen fan on every night, it has been on through sub-zero external temperatures, and in contrast to the HR25H in the bathroom seems resistant to getting iced up and unbalanced and rattling and needing to be turned off to recover. This is possibly because the Tempra fan is on the warm side of the exchanger. The fan has been helping laundry dry (sometimes we put it in boost when we're not in the room and there's a fresh load out) and, I think, helping to avoid moisture migrating out of the kitchen to the rest of the house, to the point where, in conjunction with the cold dry air outside, we've needed almost no dehumidifier use and RH is staying around or below 70% most places. 2013/01/06: we seem to be getting more used to the small amount of noise from the fan, and it is being left on at night for now. Vent-Axia Lo-Carbon Tempra - single-room heat-recovery range. First published 2012-11-27 , updated 2019-04-22 . Site copyright © 2007-2019 Damon Hart-Davis. Hosted by ExNet.